I wonder how this is going to work out. It takes the entire flow of the Nile for 11 months to fill the dam. It can take many years to fill up a dam's reservoir. While Lake Mead took about 4 years, Lake Powell took about 15. In any case, this GERD is going to be a real challenge to all countries involved. Here is an article discussing the subject. "The 100th meridian bisects the Great Plains of the United States and effectively divides the continent into more arid western and less arid eastern halves and is well expressed in terms of vegetation, land hydrology, crops, and the farm economy. Here, it is considered how this arid–humid divide will change in intensity and location during the current century under rising greenhouse gases. It is first shown that state-of-the-art climate models from phase 5 of the Coupled Model Intercomparison Project generally underestimate the degree of aridity of the United States and simulate an arid–humid divide that is too diffuse. These biases are traced to excessive precipitation and evapotranspiration and inadequate blocking of eastward moisture flux by the Pacific coastal ranges and Rockies. Bias-corrected future projections are developed that modify observationally based measures of aridity by the model-projected fractional changes in aridity. Aridity increases across the United States, and the aridity gradient weakens. The main contributor to the changes is rising potential evapotranspiration, while changes in precipitation working alone increase aridity across the southern and decrease across the northern United States. The “effective 100th meridian” moves to the east as the century progresses. In the current farm economy, farm size and percent of county under rangelands increase and percent of cropland under corn decreases as aridity increases. Statistical relations between these quantities and the bias-corrected aridity projections suggest that, all else being equal (which it will not be), adjustment to changing environmental conditions would cause farm size and rangeland area to increase across the plains and percent of cropland under corn to decrease in the northern plains as the century advances." That pair of Seager papers is very good. I can see that i will spend some hours on it. Thanks for the link. While the city has removed for this year the threat of a “Day Zero” when it would turn off the taps, daily consumption remains 57 million liters above the target of 450 million. Cape Town residents were warned to prepare for potential flooding Monday, on the same day that the average level of dams serving the drought-hit city dwindled to just 20 percent. Those at interesting models. We will see if recent precipitation increase observations will change to follow it. What’s happening could be seen as the slow death of an era of easy living, the unwinding of a nearly 100-year-old series of multi-state compacts (collectively called “The Law of the River”) that’s been widely viewed as too permissive. Over-reliance on the Colorado River has helped pave the way for rapid population growth across the region, from Southern California to Denver, which may now, ironically, begin to pose a threat to those same cities. “Dating back to 2000, this current period is one of the worst drought cycles over the past 1,200 plus years,” the bureau’s statement said. Look! A federal agency is pushing for urgent climate action. Dam levels in reservoirs serving the drought-hit South African city of Cape Town jumped by 5.8 percentage points last week after rainfall in May exceeded year-earlier figures and as residents continued to endure strict curbs on water use. The dams were 29.8 percent full as of Monday, compared with 24 percent a week earlier, and 19.6 percent at the same stage in 2017. The level crept up to 30.4 percent on Tuesday, the city said in postings on its website. Three years ago, it was at 79 percent. May’s rainfall of 216.3 millimeters (8.5 inches) was close to the long-term average, city authorities said in a statement. Residents still aren’t meeting a target of reducing daily consumption to 450 million liters (119 million gallons), using 530 million liters daily last week, an increase of 5 percent on the previous week. My great niece and I walked across the Rio Grande. Although I found a spot 20-30 cm deep, my g. niece was never in over her ankles. (There were pools along the edge that looked like they might be deep.) I learned that the channel that used to carry most of the Rio Grande during the summer in south central New Mexico is no longer used for that purpose, and I noted it was dry below a permanent weir, holding water for local irrigation. Note the truck tire marks showing where some fool drove in the river bed. The local river banks where we walked would be impassable. My great niece and I walked across the Rio Grande. Although I found a spot a 20-30 cm deep, my g. niece was never in over her ankles. (There were pools along the edge that looked like they might be deep.) I learned that the channel that used to carry most of the Rio Grande during the summer in south central New Mexico is no longer used for that purpose, and I noted it was dry below a permanent weir, holding water for local irrigation. Ahead of the summer, Delhi sees the same story play out every year. Of depleting groundwater levels. Of the water mafia who run illegal borewells. Of apathy by Delhi administration. Of haphazard urbanisation and flawed development models. Of faulty or non-existent plans to meet the ever-rising demand for water. Of courts reprimanding civic authorities. But more than anything, of a callous Delhi citizenry that exploits groundwater as if there is no tomorrow. On May 9, many citizens woke up to alarming newspaper headlines that pointed to the over-exploitation of groundwater, with the Supreme Court calling the situation "semi-critical". The Central Ground Water Board (CGWB) told the top court that in different parts of the capital, the groundwater level has steadily declined from 0.5 metre a year to more than two metres a year and "could lead to a crisis if not halted". ...But the most serious revelation made by the CGWB report submitted to the top court is that New Delhi is now counted among "overexploited" zones. It is the same area that witnessed acute water retention till the 1970s, following which New Delhi Municipal Council (NDMC) deployed sumps to pump out the excess sub-surface water. In the late 80's up to 2004 I did water projects in several large cities in South Asia and China. The story was the same everywhere - depletion of groundwater, illegal wells, water tariffs giving cheap water to the rich and expensive water to the poor, new water projects always lagging behind population growth and industrial demand. In many places, it was as bad or worse in agricultural areas - groundwater levels dropping like a stone. Somehow the situation was and is always bad but never quite Armageddon. The worst was Jordan. In the Northern third of Jordan the average lift of water from source to consumer was over 700 metres. Water is heavy. In Israel there are wells over one kilometre deep. They are investing heavily in desalination - but that is still - despite improved reverse osmosis systems -very expensive in energy and cost. These problems exist AGW or no AGW. However, climate change may be the final nail in the coffin for one of these large cities somewhere in the world (Mexico City, Phoenix Arizona?). Who knows. 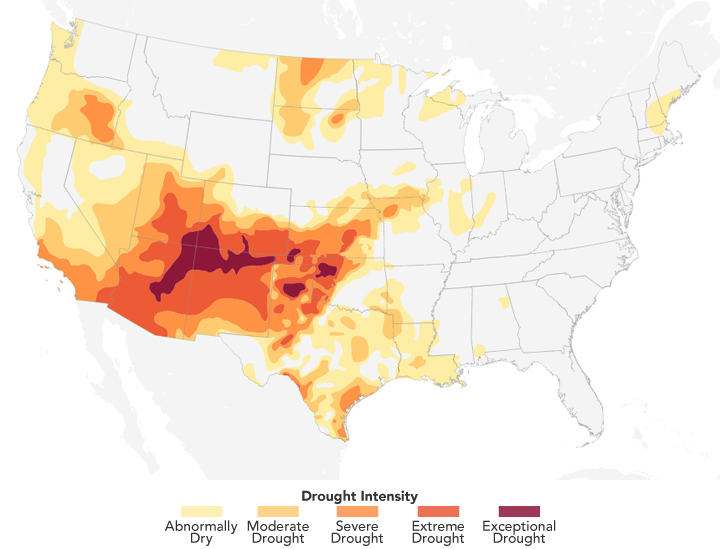 Over the past 120 years, the US as seen a decrease in areas experiencing the worst drought. I seem to recall that the big dam in China was projected to have the same issue (years to fill up), then a series of storms hit the area and it was full in less than a year, and helped reduce downstream flooding. I hope the Nile / Ethiopian dam can experience a similar fill scenario. December was the end of their seventh calendar year of below-average rainfall. In the 12 months to May this year, they have had just over 50% of their annual average rainfall. They are relying on two bores and have begun selling their cattle as it becomes harder to sustain the high cashflow that’s necessary to buy in feed. “We spoke to the owners who had this property from 1954 to 1989. We asked what the creek was like in their 34 years. They said it had never dried up,” Fleck says. During the past 14 months, the Bureau of Meteorology has recorded below-average rainfall across New South Wales, central Queensland, the north-west of Victoria and into South Australia. NSW has been the hardest hit in 2018. With the exception of the north and south coasts, most of the state has recorded the lowest rainfall in a five-month period since 1900. "(CNN) India is facing its worst water shortage in history. Six hundred million people are dealing with high to extreme water shortage, according to a report by Niti Aayog, a policy think tank for the Indian government. The report states that an average of 200,000 Indian lives are lost every year due to inadequate supply or contamination of water." "Twenty-one major Indian cities are estimated to run out of groundwater by 2020 -- just two years away." Friends up north are reporting trouble (Vermont and Maine; I'm in Boston). This is a somewhat folksy response in a discussion group I'm part of; the writer is an expert meteorologist who tracks these things and lives in the middle of Maine. These problems are minor in the global scheme of things, but we are only just getting used to fairly serious droughts in northern New England. I hear that England is also in trouble (from a friend there). Everything south of Augusta stayed dry and didn't even see that many clouds. Aroostook hit the jackpot with well over an inch as most of the rain fell there and into southeast Quebec. But this system really didn't have any tropical moisture with it, only what it had managed to pick up as it crossed the plains and southern Ontario near the Great Lakes. That's what I was getting at when I said the polar vortex circulation has remained stuck over Nunavut, sometimes wobbling this way and sometimes that way across northern and northeast Canada. Currently it's actually split with one half sliding closer to Greenland and the other half over the Northwest Territories as a big blocking high has set up over most of Nunavut in between. But that pattern has still diverted the main jet stream on a west to east track across the Midwest and Northeast and that spells very dry conditions for this part of the world as only a few hit or miss rain systems occasionally manage to come through while most of the wet tropical air remains locked up down South. Good luck with the garden. Things could still change as we get into the summer, but don't count on it. I think we'll all need some luck with our gardens again this year!! At some point they will have to make some hard choices. Do they continue to use thermal energy(boil [and evaporate] water) to make electricity or use it for agriculture and drinking. They seem to be making a token effort to install renewable energy but they will be lucky to hit their own targets and decades behind the Paris targets. I would add that the warmer the ambient temperature of the air and water the less efficient all thermal powers plants. That's not just a India problem since we regularly shut down power plants in the US for the same reason. Online videos appear to show Iranian security forces shooting at protesters early Sunday amid demonstrations over water scarcity in the country’s south. Online videos appear to show Iranian security forces shooting at protesters early Sunday amid demonstrations over water scarcity in the country’s south, though authorities said only one person was wounded in the clashes. The protests around Khorramshahr, some 400 miles southwest of Tehran, come as residents of the predominantly Arab city near the border with Iraq complain of salty, muddy water coming out of their taps amid a years-long drought. Exacerbating that unrest is the drought. The Iran Meteorological Organization estimates 97 percent of the country faced some form of drought. Analysts also blame government mismanagement for diverting water away from some farmers in favor of others. I forgot a crucial other factor: Overpopulation. E.g. Syria and Yemen have vastly overstretched the carrying capacity of their land. Then drought is the straw that breaks the camels back. As to Yemen what pushed The Yemeni People over the edge was when those in the north who had been moving freely for hundreds of years across the Saudi border to tender their farms water wells etc were blocked from doing so when the Saudis built a Border fence and unilaterally banned the Yemenis from crossing the border anymore a few years ago - then the Civil War started as a result because the Yemeni (Saudi controlled) Govt did nothing about it. The people started to starve and their children were malnourished and started to get ill and die. The Saudi-Yemen border is mostly desert (Rub' al Khali, the Empty Quarter). Nothing to quarrel over there. To the west there's some green, equally distributed between Saudi Arabia and Yemen. I don't see any reason for complaints - Except one side has overstretched their resources (and then it is unsurprising when history repeats itself...). The Houthi almost captured Najran Dam in 2016. Perhaps one factor why the war grew so fierce. With the population in this desert country growing 6 times in about 65 years, while water resources have not grown and there are not enough natural resources/oil/export industries to support massive food imports, no wonder there are widespread food shortages and a civil war. They are just on the fast lane of the road we are all on. Europe has changed color. The Alps, however, appear much snowier than normal. Probably residual from springtime but nevertheless a possibly significant development. if there is any institution i trust 100% when it comes to snow and avalanges it's this one, flawless record and used by most scientists as reliable source. as to the rest i dunno whether this is possible to get in good enough english but in general it looks like extreme winter snow masses turned into earlier than average meltout. Auf dem SLF-Messfeld am Weissfluhjoch Davos (2536 m, GR) waren die 118 cm Schnee (Schneehöhe vom 01.06.) in 20 Tagen geschmolzen. Das Messfeld war am 21.06. ausgeapert, 18 Tage vor dem durchschnittlichen Ausaperungsdatum am 09.07. Thanks! Evidently though we may be better than some / many recent years summer is still below historical avgs in this area. Good to know. Thank you Magna. Here is what they have to say about snow trends, I will also post it to the NH snow thread where it properly belongs. Thanks to the long-term measurement data, we have been able to identify some clear trends. The last 30 years have seen very low levels of snow, particularly on the Swiss Plateau. The trend towards less snowy winters at most stations below 1300 m is statistically significant. The lower the altitude of the observation station, the more apparent the changes are. By contrast, above 2000 m the snow depths in midwinter (December to February) show no clear trend. The same is not true of snow cover duration: the vast majority of stations are seeing a clear reduction in the number of days with snow-covered ground, regardless of their altitude or location. The primary reason for this is earlier snow melt in the spring. The delay of snow onset in autumn is also a factor at lower-altitude stations. In addition, the annual maxima for snowfall and snow depths have tended to decline at all stations over recent decades. Since President Nicolas Maduro took control of the Venezuelan government in 2013, the country has endured a growing wave of human rights abuses and resource shortages. Maduro put many industries, including the water sector, into the hands of the Venezuelan military. Water in the socialist nation is supposed to be subsidized and government-provided, but mismanagement and decaying infrastructure force most citizens in the capital, Caracas, to rely on trucked-in water or communal pumps. As the military takes control of the city’s water points and supply trucks, access is becoming more restricted and the price of water is soaring. Throughout the rest of Venezuela, access to water, food, medicine, and other staples is also restricted. Last week, in the city of San Felix, a 12-year-old boy was shot in the chest during a protest over water and electricity outages. Similar protests are igniting across the country as Venezuela’s economy and infrastructure collapse. July 2018 was the driest July in Australia since 2002. The dry month exacerbated an ongoing drought that had already ruined large swaths of grazing land and cropland. New South Wales has been hit the hardest, according to a news reports. About 99 percent of the state was in drought heading into August. There are a lot of changes in this week's US #DroughtMonitor - Exceptional #drought spreads in MO & KS while Extreme drought appears in OR & expands in CO. More expansion of drought in the High Plains & Pacific Northwest. Reports warn it could run out of groundwater by 2020. Has Delhi run out of time to reverse years of mismanagement and unchecked urbanisation? Population growth, climate change, disputes between states, urbanisation and poor management of resources have made water – especially fresh, clean water – a commodity that is not readily available to all. A recent government thinktank report revealed that several major cities in India, including Delhi, could run out of groundwater as soon as 2020. Ironically, the fight for water now comes amid heavy rain. May’s heatwave has given way to the monsoon season, causing flooding across India. Last week flash floods in Kerala killed 37 people and displaced a further 36,000. For much of Delhi’s history, this seasonal rainfall was harnessed for use during the summer from March to May, with water stored and distributed through check dams, stepwells (baolis) and natural drains (nullahs). It reflected a philosophy that urban environmental planner Manu Bhatnagar calls “respecting the topography”, which has since fallen by the wayside in the city. 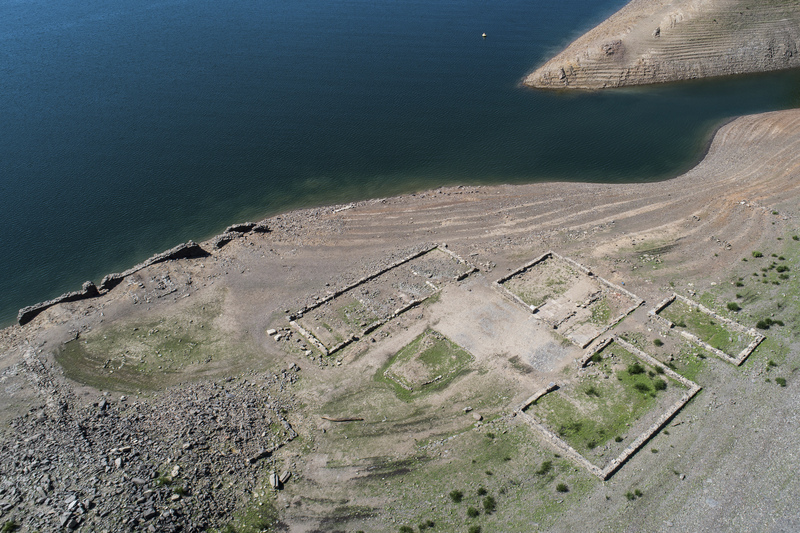 Drought reveals remains of German ‘Atlantis’ in lake Village abandoned when a large reservoir was created more than 100 years ago. Germany’s third-biggest reservoir is being drained to keep water levels on the Weser river high enough for shipping. Like many European countries, Germany has seen remarkably little rain in recent months. The government is expected to decide Wednesday whether to provide federal aid to farmers whose business has suffered from the drought. Eight German states have already reported drought-related damage amounting to $3.4 billion. Falling water levels of a river in Europe reveals forbidding omen. Due to this summer's drought in Central Europe, boulders known as "hunger stones" are reappearing in the Elbe River. The low water levels in the river that begins in the Czech Republic then crosses Germany into the North Sea has exposed stones on the river bed whose appearances in history used to warn people that hard times were coming. 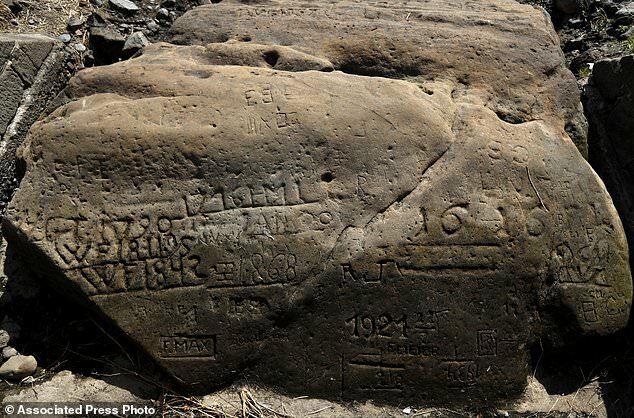 Over a dozen of the hunger stones, chosen to record low water levels, can now be seen in and near the northern Czech town of Decin near the German border. The oldest water mark visible dates to 1616. That stone, is considered the oldest hydrological landmark in Central Europe, bears a chiseled inscription in German that says: "When you see me, cry." Here is a better picture from 1904. The oldest inscriptions 1417, 1473 are meanwhile gone, eroded by anchoring ships. where they have an even better video. The "Hunger stones" are totally new to me. I've a number of friends that devote themselves to discovering and attempting to decipher ancient petroglyphs in the deserts of the American Southwest. I think that they will be very interested in this information. "When you see me, cry." I have amazing news for you. Man is not alone on this planet. He is part of a community, upon which he depends absolutely. Some footage here of my research areas after the record drought & heat. It's pretty shocking especially when we have given ample warning for this type of disaster being made a lot worse by mismanagement. The Dutch are still hellbent to recreate the vegetation of before 1600. Species such as heath, blueberry, rowan, etc which have no chance and additionally are a fire hazard. While wiping out others such as wild cherry which is now pretty much the only remaining food source producing fruit and even more essential to the food chain. So with nothing to eat, wildlife has pretty much fled into the city where more trouble awaits. Page created in 0.04 seconds with 28 queries.